Why is a Theory of Change Important? A Theory of Change examines our ideas or assumptions of how change is expected to happen. 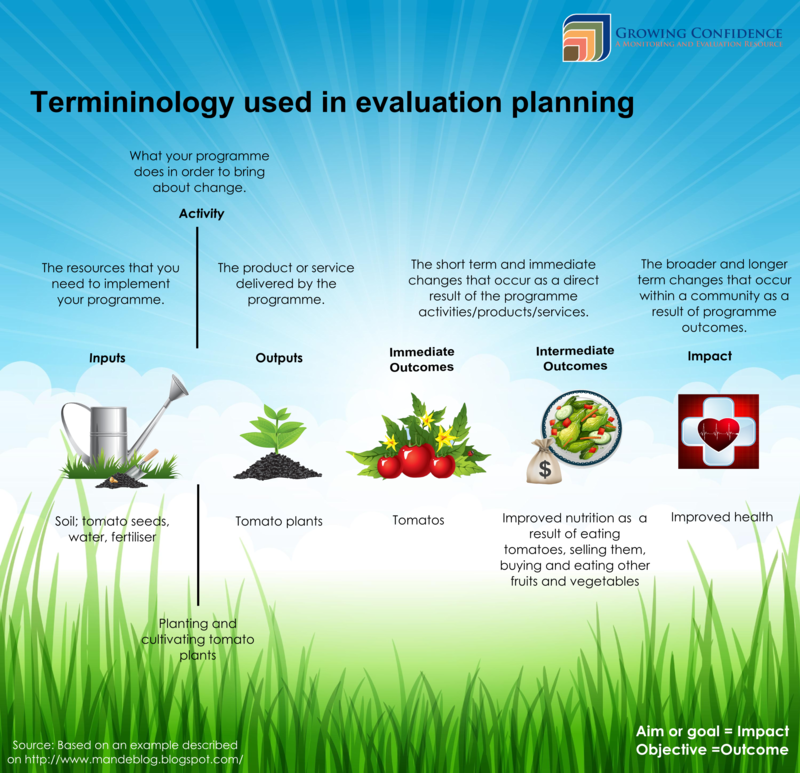 It can be very difficult to interpret the results of an evaluation without any programme theory, as we will illustrate. Let’s use an example of a hypothetical programme that tries to improve the nutrition of teachers in an underprivileged community, by teaching them to cultivate tomato plants in school gardens. How does this work? This is precisely what your Theory of Change explains. At the outset, this programme invests resources such as seed, soil, water and fertilizer. Through different activities, like training teachers to plant, fertilize and water the tomato seeds, the programme staff hope that the teachers will soon be producing tomato plants. One of the products of the programme is tomato plants; another is teachers who are trained to cultivate the tomato plants. We call these programme outputs (see the infographic on M&E planning terminology). A short-term outcome is a reasonable harvest of ripe, succulent tomatoes. The theory of the programme is this. If the teachers eat more tomatoes, they will experience better nutrition and health in the long term. They also might be able to sell the surplus tomatoes and use the extra cash to buy more food and supplement their diets further. In a chain-effect the programme staff hope that teachers will ultimately become healthier and more effective teachers and from this provide better education to the children they teach. Imagine if you are evaluating the programme and you assume that this programme will ultimately be effective if it shows that teachers who have participated in the programme are healthier than before they took part. This assumption would, of course, be correct. You therefore don’t give a lot of attention to how the programme is supposed to work in theory, but choose to cut to the chase and assess the level of health of teachers before and after the programme. You find no difference in their health and so conclude that the programme is ineffective. Technically, you have evaluated the programme, but it has not been a very helpful evaluation as it leaves the programme staff with nothing but a sense of failure. You will not have answered the key question - why is the programme ineffective? Is it because the idea is not viable? Or did the teachers struggle to look after the plants because of a lack of water or disease? Perhaps the tomatoes were not harvested when they should have been, or the teachers did not cultivate them properly due to a lack of motivation or understanding of the training. The list could go on. If the time is taken to document a Theory of Change during programme design, then this can be used to assist people in choosing activities and identification and mitigation of risks at an early stage. For example, as part of the Theory of Change you will identify some of your underlying assumptions. In this example, one might be assuming that there is an adequate water supply to the school gardens. Noting this will ensure that the programme staff are aware that this is a key factor for success. This might result in staff developing site assessment procedures before they start implementing the programme at a particular location. If they design an M&E system to collect information on all the different aspects of their Theory of Change, their evaluations will not only tell them whether their programme was effective or not but also why. Feel free to explore other interpretations of the Theory of Change. Actknowledge and the Theory of Change Community have developed a complete programme design and M&E planning process. You can access these resources and other free software from the Toolbox.